View the Labels/SDS information for Meridian 0.33G Insecticide. 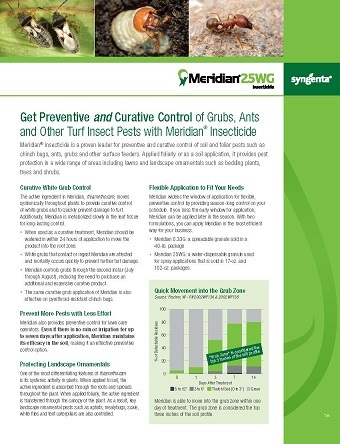 Meridian® insecticide provides turf managers with an unprecedented degree of control and application flexibility in managing a broad spectrum of grubs and insects on their turf. For more information, please consult the label or call the Syngenta Customer Center at 1-866-SYNGENTA (796-4368). 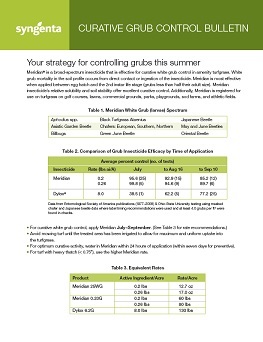 Meridian® 0.33 G insecticide provides turf managers with an unprecedented degree of control and application flexibility in managing a broad spectrum of grubs and insects on their turf. This granular formulation contains .05 oz of active ingredient per pound of formulated product, and is conveniently packed in 40 lb. bags. Meridian is also available in a 25 WG water-dispersable granule. Meridian controls soil and foliar pests at very low rates, through both contact and ingestion activity. It also is effective and suitable for use on trees and shrubs. There is a wide application window, allowing for flexibility regarding the time of application needed to maintain season-long control. Meridian has curative properties through the late second instar of insect development. It leaves little or no odor, and metabolizes slowly in turfgrass, allowing for extended control with good knockdown activity. Insects controlled include soil pests such as billbugs and white grubs (such as Japanese beetles, oriental beetles, and European, Southern and Northern masked chafer); and foliar pests such as aphids, whiteflies, mealybugs and leafhoppers—among many others. For more information, please consult the label or call the Syngenta Customer Center at 1-866-SYNGENTA (796-4368).